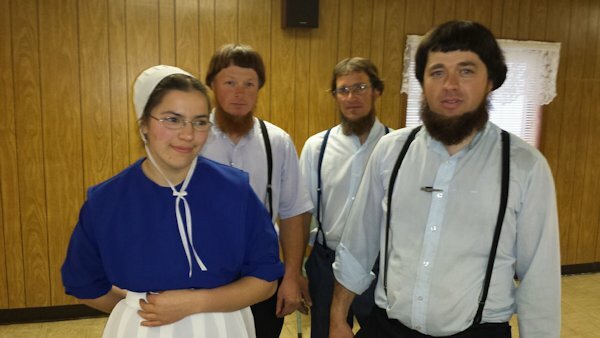 The Roseville Amish School Board members were very pleased Friday evening after their benefit chicken and ham dinner fed over 300 area folks who gave so generously to help support their school functions and future building. Three board members oversee the finances, mechanics and "whatever it takes" to run the school which serves ages 6 to 12 and runs under Illinois state guidelines. Teacher Nancy Lee conducts the classes for eleven children (the oldest almost 13) in the basement of the Cedar Pine Discount Store along HWY 116 west of Roseville. Board members Eli Beachy, Marvin Slabaugh, and Daniel Lee expressed their plans for building a new school as funds are raised and are researching a location to build. Nancy Lee said students have already completed school work for this school year's session over a month ahead of public schools. Bennie (retired) and David (carpentry) and John Summy (works with Blue Jay Barns).and he does alot of roofing and pole barns. They really enjoy the folks here.